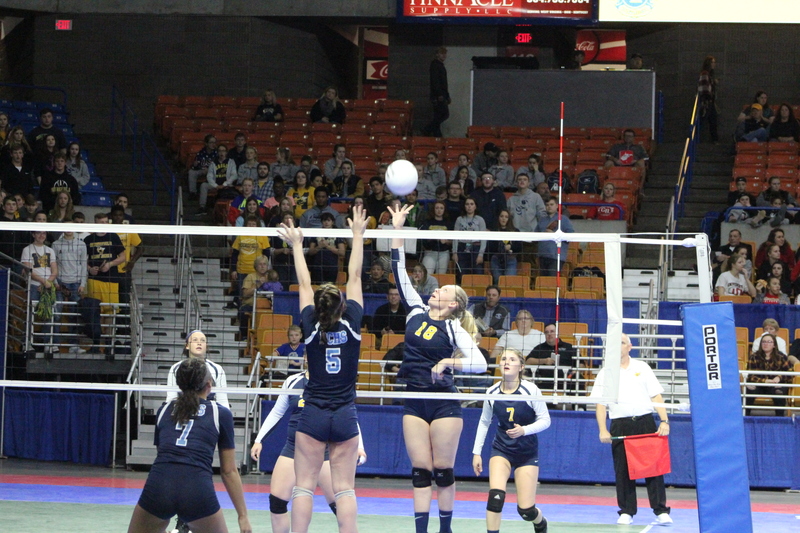 The Lady Yellow Jackets were grounded on the courts by Parkersburg Catholic in the Class A state volleyball quarterfinals at the Charleston Civic Center last Friday in straight sets: 25-17, 25-11 and 25-20. 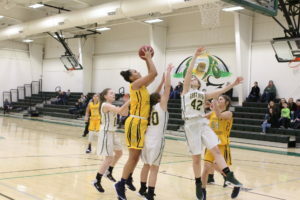 Moorefield entered the state tournament for a fifth straight season, but that experience wasn’t enough to survive the attacks by the Lady Crusaders causing an early exit. 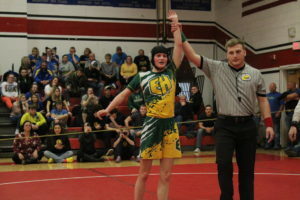 Parkersburg Catholic had a hiatus from the state tournament for about six years and advanced to the semifinals for the first time since 1995. Even though the visit to Charleston was shorter than expected, the Lady Yellow Jackets were energized by the group of classmates supporting their squad through a pep bus trip. “The first set we came out a little sluggish and fought our way back a couple times, second set same thing and third set same thing, but they didn’t stop. They didn’t give up and kept fighting and fighting. I think that says a lot about them and the way they played the whole season. 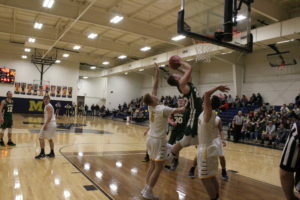 We’ve had a lot of situations this season and we continued to battle through them and that says a lot about our team and their character,” Moorefield Coach Morgan Hill-See commented. The state volleyball matches were played on three courts simultaneously with each class represented with plenty of excitement, but the freedom to have these contests couldn’t be possible without the protection of our military service members and all veterans in attendance were shown respect with an announcement and applause moments before the national anthem. Starting the opening set serve was Parkersburg Catholic’s Jenna Boice and Moorefield’s Anna Riggleman made the pass to Lindsey Rinker setting for Hanna Carlson to make an attack. The Lady Crusaders defended the attack, then Moorefield’s Alyssa Vetter launched a volley and it was met with a dig by Parkersburg Catholic’s Paige Stotts and redirected into the net. On Rinker’s serve, the Lady Crusaders evened the set on a kill by Aaliyah Brunny. Elaina Ross notched a spike and Gracie Lowers served an ace after a hit into the net putting Parkersburg Catholic up 4-1. Moorefield’s Rebekah Markwood earned a point off an attack, but the Lady Crusaders answered on a volley from Ross during Vetter’s serve. Markwood made a push attack and the ball was returned into the net, but the ensuing serve by Carlson hit the net. Moorefield’s Sydney Hardy and Madison McGregor made digs on attacks from Brunny before Boice found the floor for a 7-3 lead. An attack by Parkersburg Catholic’s Paige Stotts was saved by McGregor and Remington Hinkle’s volley created a point for the Lady Yellow Jackets as it was deflected out of bounds. A push point by Markwood during Hardy’s serve closed the gap to 7-5. Ross made a kill prior to serving into the net, then Markwood’s jump serve was saved by Boice and returned into the net, 9-6. Riggleman made a save on an attack by Brunny, but it landed just out of bounds over the net. A serve from Stotts was redirected into the net as the Lady Crusaders took an 11-6 lead and timeout was called. Hardy notched a dig, then Rinker’s attack ricocheted off Brunny and carried as the Lady Yellow Jackets earned the point. Riggleman’s serve was returned into the net creating a 13-8 score. Moorefield’s Gracie O’Neill made an attack and it was blocked by Brunny. After an errant volley by the Lady Crusaders, Brunny and Ross executed spikes. On a serve by Lowers, Markwood’s dig careened over the net and landed for a point, 16-10. Parkersburg Catholic responded with three kills by Ross, but struggled to close out the set. O’Neill’s volley was carried by the Lady Crusaders, then O’Neill served up an ace for the Lady Yellow Jackets. After a spike from Ross, Markwood’s attack was returned into the net. The Lady Yellow Jackets hit the ball four times during a volley from Boice and Markwood added a point on a push. Markwood’s serve was sent back out of bounds as Moorefield sliced the deficit to 21-15. Parkersburg Catholic took momentum back on three kills from Brunny before Stotts served out of bounds. Carlson made an attack that was redirected into the net, but the Lady Crusaders closed the set on a spike by Brunny for a 25-17 score.